Hurray – our new demo garden is officially open. Sunday at the 100th Annual Weld County Fair we had a ribbon cutting ceremony to open our new garden. It’s looking great despite the two hail storms that pummeled it. A testament to the plants selected for the garden. Hardy enough to come back and look lovely after a brutal storm. Two weeks ago we did do some extra planting in a couple of small areas that were hit especially hard so it wouldn’t look too bad, but the original plants really rebounded and are doing quite well. The ceremony was held at the garden in front of the Exhibition Building in Island Grove Park. This is where the Weld County Extension office is and where you can bring in samples of any garden troubles you are having for the Master Gardeners to help resolve your gardening or lawn problems. You may also call in or e-mail and ask your questions and a Master Gardener will answer them as soon as possible. Contact information and our address are included on the right hand side of this blog page. Please check it for this and other CSU extension information. Invites went out to our sponsors and many attended from Weld County and the City of Greeley. Thank you to the county commissioners and the other city officials who attended. Thanks again to Island Grove Park, City of Greeley, and the Colorado Garden Foundation, and Master Gardeners for all of their support and contributions to the garden. In March this space was full of weeds and not much else, and without everyone’s time and effort it would have been impossible to pull this off in five months. Noel Johnston, one of our Master Gardeners introduced Amy Lentz, the Agricultural/Horticultural/Master Garden Program Agent for Weld County. For a detailed description of how, and why this garden came to be, please check out the ABOUT section of this blog. It gives the history of this space, and what it used to be before its transformation and what we hope to achieve with this space. After Amy’s speech, Mary Jansen-Hedrick cut the ribbon. Mary is one of our Master Gardeners that was instrumental in getting this garden going. Master Gardeners were on hand to give tours of the garden. This is no longer THE FUTURE home of the Weld County Master Gardeners Demo. It’s time to stop calling it that because it IS NOW officially open. We encourage you to stop by Island Grove Park and check it out during park hours (or when you stop by the extension office to come and see us). The Master Gardeners were out volunteering at the Weld County Fair this week. While out there a few volunteers worked in the garden to get it ready for our ribbon cutting this coming Sunday, the 29th at 1:00 pm. It’s looking so nice. Recently someone asked why there were so many weeds in the garden. It had recently hailed. One of those close your eyes and hope for the best type hails. Lots of plants were damaged and shredded. It takes at least two weeks to determine what is a weed and what is a plant in some cases. The plants were just recovering and so were the weeds. Fortunately the damage to the garden was minimal. All of the weeds are gone now and it’s looking lovely. Here’s a PlantTalk article about hail. We hope to see all of you at our ribbon cutting Sunday, July 29th at 1:00 pm in front of the exhibition building at Island Grove Park. It’s the last day of the fair so come on out and check out all the exhibits and join us for the ribbon cutting. Parking and admission are free. 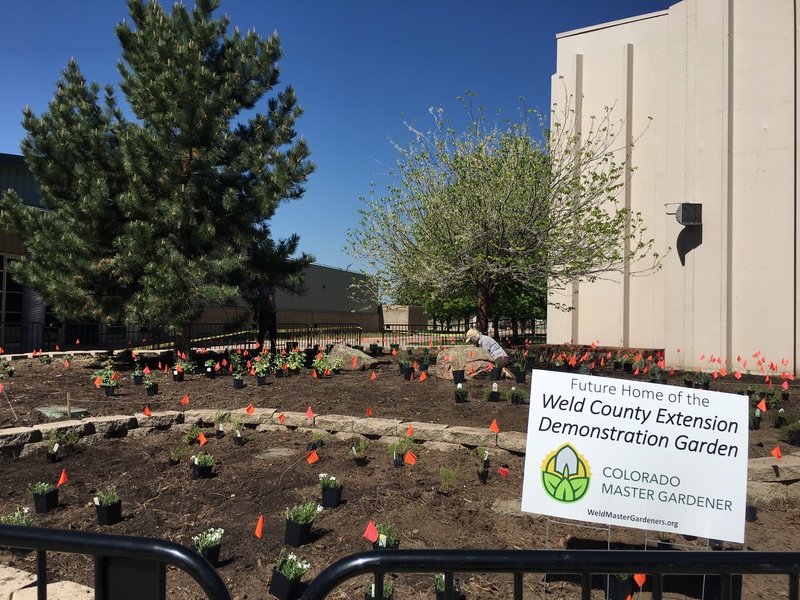 The Master Gardeners of Weld County invite the public to the Ribbon Cutting Ceremony to celebrate the official opening of the Weld County Extension Demo Garden. The event will be held on Sunday, July 29 at 1:00 pm. Funded by the Colorado Garden Foundation and the City of Greeley Water and Sewer Department, the garden will be a central location for educational opportunities for community members to ensure successful gardening practices in their own backyards. The demo garden gives Weld County Master Gardeners a space to put their skills to work, and a space where they can learn more about gardening. 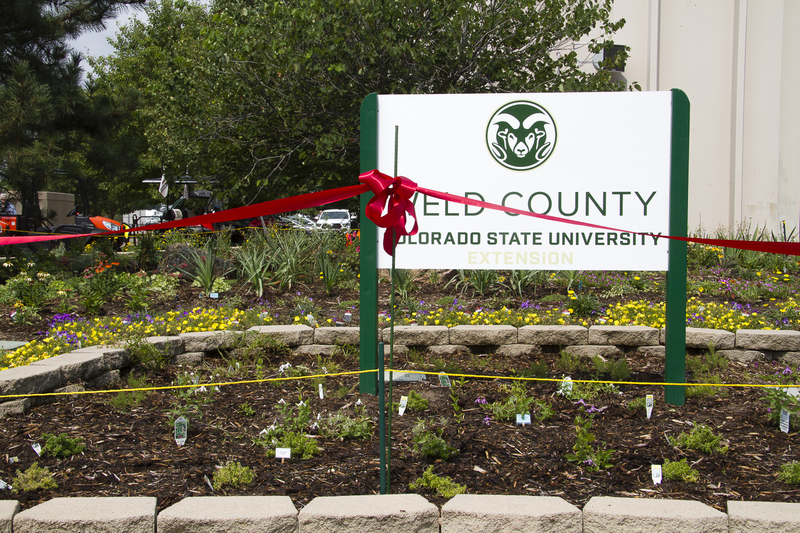 The garden is in front of the Weld County CSU Extension office, located at Island Grove Regional Park in Greeley. From renovation to maintenance, the garden will serve several purposes ranging, from hands-on classes for all ages to demonstrations on a variety of topics. 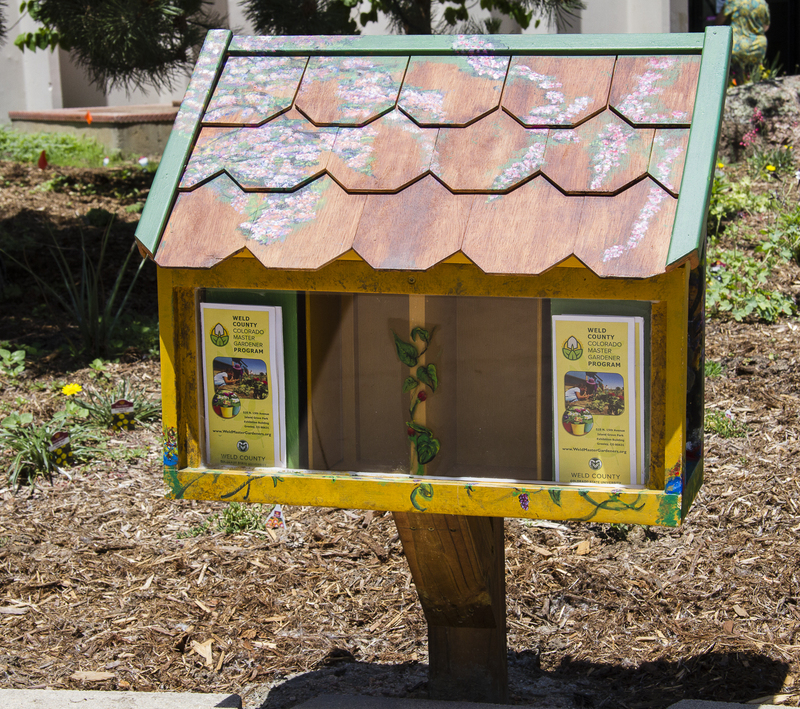 There is also an information kiosk featuring an assortment of gardening pamphlets. The garden showcases water-wise plants, selected for their drought-resistant qualities, which align with the local climate and soil conditions. Plants were selected specifically for Colorado and recommended by Colorado State University for Weld County and this climate zone, demonstrating the need to use the right plants in the right places. Ultimately, the demo garden will beautify the Weld County Extension Office, and increase visibility and awareness of the free gardening programs available to the community and visitors to the fairgrounds. There are two beds: One features the “Garden in a Box” program, which is designed for the novice gardener or anyone hoping to avoid the hassle of designing a garden from scratch. “Garden in a Box” is a professionally designed do-it-yourself xeric (low water) perennial flower or vegetable kit. This bed, near the extension office, displays five “Garden in a Box” options, including Purple Reign, Butterfly Bounty and Colorado Native Plants. Please join the Weld County Master Gardeners to celebrate the Weld County Extension Demo Garden at Island Grove Regional Park! The Grand Opening ceremony begins at 1:00 pm on Sunday, July 29th. For questions regarding your garden, turf or trees, or the Opening Ceremony, please give us a call at 970-400-2066. A Weld County Master Gardener will return your call as soon as possible. It was major excitement the day the plants arrived. The people who ordered plants had them scheduled to arrive in two shipments over two days so we were prepared to go and unload and plant one shipment and the next day plant the next shipment. Well, of course nothing ever goes exactly as planned. We had a big storm move through the night before so we went to Plan B. 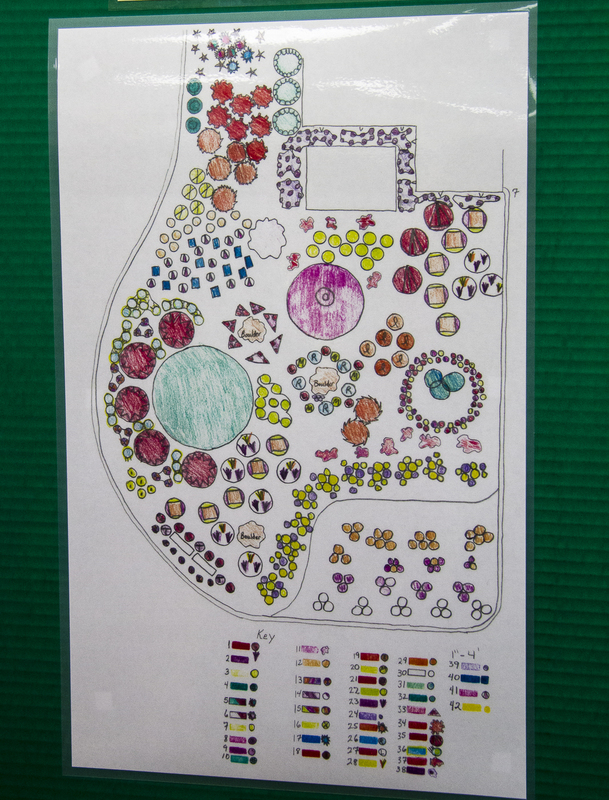 Prior to the planting day the design ladies were busy labeling the garden so everyone would know what goes where. They started out making flags for every plant that was to go in the garden. Oh boy, they soon realized that would take forever. They were all like, yeah, let’s do this. It will take a couple of hours at the most. They soon decided they should just make one flag and write the quantity of plants in that area which greatly cut down the time. Even doing that it took them six hours to make all the flags and put them throughout the garden so all the planters would know what goes where. Easy peasy right? Delivery day arrives. The first truck is unloaded and since it’s so wet this is sorting day. More flags were made to put in each plant variety with the quantity of how many there should be. The Garden In A Box plants were sorted, flagged and staged by the different gardens. The rest of the plants were sorted by plant type. Easy, right? Well, it would be if we all knew the scientific names of all the plants. Plants were ordered by scientific name so had to be flagged by scientific name, and the hunt was on. OK, what is this plants common name so I can find it or have some idea of what I’m looking for. It was quite the education trying to look at a flag, find the plant by the scientific name, and sort them out. It took a lot longer to have to go pull the little plastic label from the pot to read what it was so we could get the right flag in it. We decided since some flats had to be divided into more than one place in the gardens and we didn’t have all the plants for some areas of the garden as they weren’t arriving until the next day that it was a good thing to stage all the plants by garden area and then the second delivery day we would have all the plants before trying to place them where they belong. So, all in all the rain was a good thing. Oh boy!! We actually get to plant the second day. Again, with the scientific names. Some fun with everyone outside asking what is this and where does it go, is this the right amount, which direction do they go around the rock, where exactly in this area? No, those are sorted, don’t touch them yet. A big THANKS to all the design team members for being at the planting. They worked so long on the design they could almost tell us where each plant was supposed to be. Without them being there, even with the great flag system, it would have been chaos. The first day we worked about 4 hours unloading and sorting out plants. Day 2 was a huge day. All those plants had to get in the ground. It took about 15 of us (dwindled down to maybe 10 at the end of the day) seven hours to plant all the plants. It was interesting to see all the different plantings styles, sitting with bent knee, sitting with straight lets, just bend over, kneeling, and even laying down! A long day but the task accomplished. After planting we turned on the new irrigation to give them a soak and all worked great. And then we all decided we all needed to go home for a long soak as well. A couple short discussions of what and where? It was really no small task. First of all, thanks to the Timm family for donating their time, energy and parts to our garden. It was an interesting adventure finding out what water lines were there and which were in use or which were old. There was a lot of digging and searching going on. They found one line that went nowhere and determined it wasn’t being used and there were other places where they knew there had to be heads but couldn’t find them. They found some of them buried about six inches down. Eventually they found the lines and heads that were working. One huge pipe was busted and should have been working so that was repaired and new rotor heads were installed. 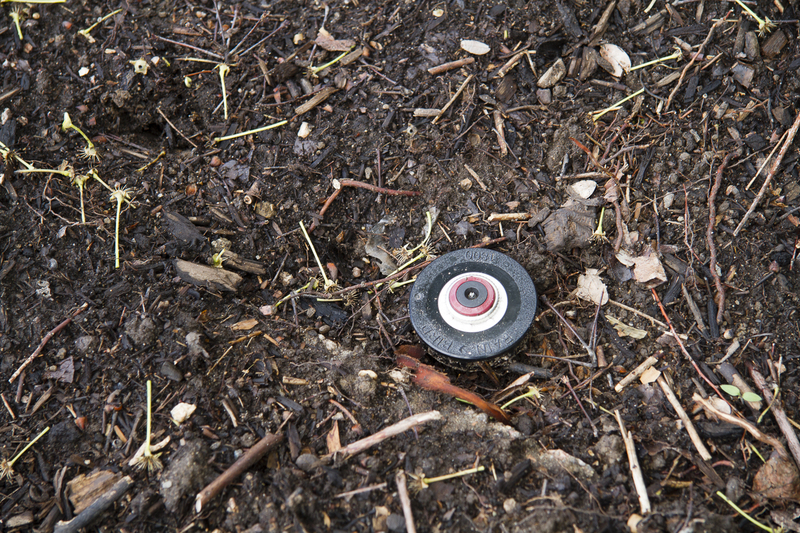 It was decided to not use drip line because there are lots of squirrels that would chew them so all of our lines are buried. Water efficient heads were installed but the water savings really come with the type of plants we use. For the first couple of years the plants will need a little more water to get established and then after that won’t need as much watering. Water usage will be monitored for the next two years to see how much water is needed and will be adjusted accordingly.